How would you like to walk in the ER confident that you knew what to do, no matter what comes through the door? The Chief Complaint uses an algorithmic approach to over 50 of the most common complaints encountered in the ER. Never feel lost or overwhelmed again, not knowing what the next step in the work-up is. Not sure what tests to order or if the patient can go home? 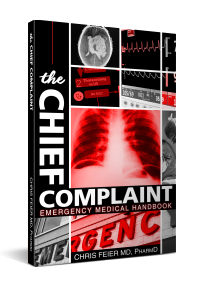 The Chief Complaint helps you answer all those questions and more. Chris C. Feier M.D., Pharm.D. I started this book during my first year of residency because I simply did not know what to do in the ER. Everything happened so fast and I was never sure what the next step was. In medical school, we were taught how to deal with diseases. But, unfortunately patients don’t arrive in the ER with a diagnosis tattooed on their forehead. This book attempts to flip our medical education around and approach the patient by how they present to us…with a chief complaint. Written by a seasoned ER physician that works both in academics and in the community.